Written by four best friends, who are also French, this book takes a more unique approach to the French je ne sais quoi. The book doesn’t really have chapters, and it doesn’t tell a story. Well, it tells a broken down story of a Parisian woman, describing everything from her hair, to her clothes, to her parenting style, to her affairs, and throwing lavish dinner parties. Apparently, the hardest part about being a Parisian woman, is making everything seem effortless. Also, it should be no surprise to find this book loaded with delicious recipes. Ones that I want to make right away. The book is funny, although the Parisian woman sounds ridiculously high-maintenance in her attempts to appear low-maintainence. I wonder though, how much of this book is real and how much is parody? How obsessed are we non-French folks, that we’ll readily believe anything and everything written about how to be French? This is definitely not a memoir, no big insights into the culture other than their fascination with appearances and simplicity. I guess simplicity is really the best definition of the French way of life. You either live a simple life, or you make sure that your complicated life appears simple to passersby. I did find a few profound nuggets of good advice in the book though. This one is my favorite. I like the concept of cheating on myself. Its like “treat yourself day” but more indulgent. Nowadays more than ever your life is organized like clockwork, everything ‘a planned, you go from A to B, yet at this instant your phone is turned off , no one knows what you’re doing or where you are. It’s exciting to break your own habits; you’re cheating on yourself, expanding the scope of your possibilities. 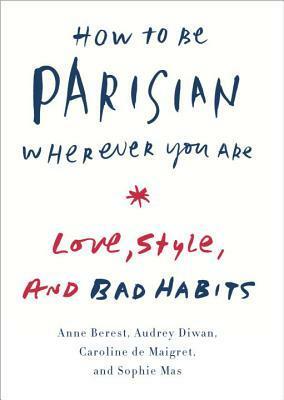 This entry was posted in Books and tagged how to be parisian. Bookmark the permalink.